Manual exfoliation by a licensed dermatologist or esthetician is performed using a dermatome, a specialized surgical blade that safely and effectively removes the uppermost layer of the skin, specifically dead skin cells that have accumulated over time. The consequences of leaving useless, old skin cells on facial skin is skin that appears dull, blemished and aged. However, dermaplaning your skin allows fresh, new skin cells to exude their healthy glow so that your face feels clean and looks dramatically invigorated. Also referred to as “blading” or “leveling the skin”, dermaplaning is performed at Mayoral Dermatology as an outpatient procedure that generally takes about 30 minutes to complete. Dermaplaning is painless and involves one of our specialists holding a dermatome at a 45 degree angle against your skin in order to gently stroke your skin to remove only the epidermal layer. In fact, it looks and feels like someone is simply giving your a professional shave! Patients are never cut and no bandages or ointments are necessary following the procedure. A: Absolutely! Professional dermatologists and estheticians at Mayoral Dermatology possess the training and knowledge necessary to perform dermaplaning using #10, stainless steel surgical blades. No downtime is associated with dermaplaning and patients often remark how clean and fresh their skin feels after the procedure is completed. 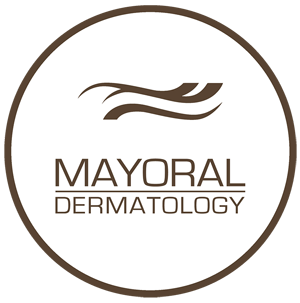 To find out if dermaplaning is right for you, call Mayoral Dermatology today and speak to our specialists who can answer all your questions concerning skin conditions and the benefits of dermaplaning.